I would like to give just a little side note. If you have not gotten a chance to read my blog entry from last week, I would like to encourage you to do so as this blog entry is a continuation from the blog entry that I posted last week. I want you to be able to get the full story. After finishing up at the Skywalker Ranch General Store, our tour guide brought us outside and led us down a different pathway that took us on the other side of Ewok Lake. The pathway curved around and brought us to the main house. This is where George Lucas works. The whole concept of the design of the house was inspired by George Lucas himself all down to the most minute detail. George had the house built after one of his favorite eras the Victorian era. The front door had this ornate glass that was so reflective that it almost looked like a mirror. It was absolutely stunning. I wanted to take a picture of the glass but I wasn’t sure if I was allowed to as you could see into the house so I refrained. But it was one of the most unique and beautiful glass windows that I have ever seen. The house is filled with art from George Lucas’ favorite artist Norman Rockwell. George Lucas had the furniture made at his own Mill Shop that he has on the ranch. All of the art glass and many of the light fixtures were designed and made at his Art Glass Studio which is also on the ranch. 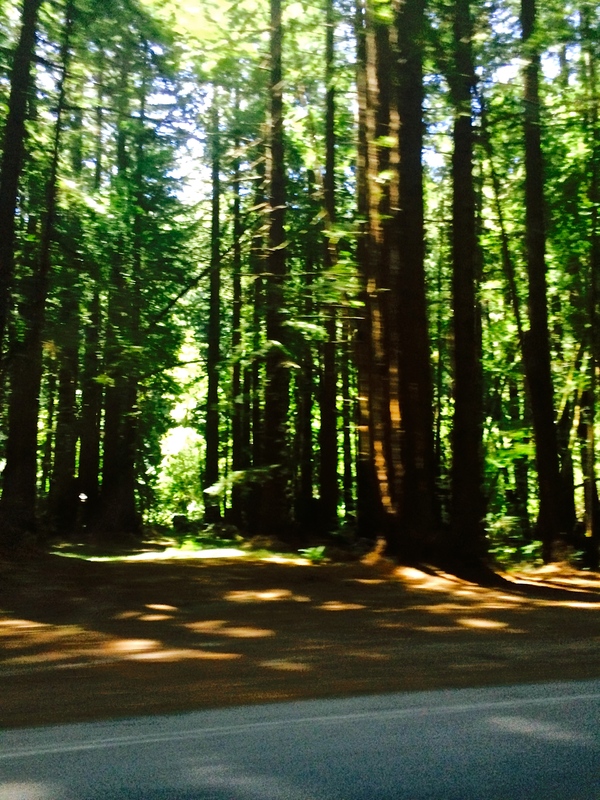 George Lucas loves Redwood so there is Redwood all through out the house. I can see why he loves Redwood so much as it is so beautiful and the color is very rich. Just a side note of something that I learned, part of the Ewok films were filmed in the Redwood trees that are just outside of the Ranch. Anyway, back to what I was originally talking about. I loved all the intricate details of the house. I know that I keep using the word stunning but everything about the house truly was stunning. When we walked into the house, there was a huge staircase in front of us with large windows by the landing. There was a beautiful fireplace in the entry. Above the fireplace that was in the front entry of the house was a glass case with a lot of George Lucas’ awards inside of it. It was cool to see all the different awards that he had from his accomplishments. We were shown another room that had another beautiful fire place in it. He has 14 fireplaces throughout the whole house. Then our tour guide took us to a little hallway that had glass cases on both sides of the walls and inside of the cases were artifacts from different movies. Such as, Luke Skywalker’s original lightsaber that was also given to Anakin Skywalker to use. The prototype of Jabba The Hutt, a mini A-Wing model that was in The Empire Strikes Back, an AT-AT model that was also in The Empire Strikes back. There were artifacts from the movie Willow. Also, from Indiana Jones (another one of my favorite movies) his hat, his whip, the golden idol in the Raiders of the Lost Ark, as well as the medallion that was used to find the ark of the covenant, and the holy grail. Charlie Chaplin’s cane with a letter of authentication was there as well. It was pretty awesome! After that, we walked through a sitting room with a Grand Piano, a Steinway to be exact. One time George Lucas had the staff all gather around the piano for Christmas and sing together. As our tour continued through the house, we saw a private theater that was for the staff. On the wall were a lot of the games that George Lucas had made. Some that I had played a while ago but hadn’t seen in a long time and had forgotten about but they were some of my favorite ones to play. George Lucas also has a library in the house that he made for the employees and for those working on films to use for work related projects. This place was phenomenal. When you walk in almost everything is made out of Redwood. When you look up, there is a huge dome-like stain glass and when the sun shines through it, it causes the room to be lit in a beautiful golden-like haze. There are also little stain glass windows all around the top of the room. The library reminded me a lot of the library that was the movie Indiana Jones and the Last Crusade. 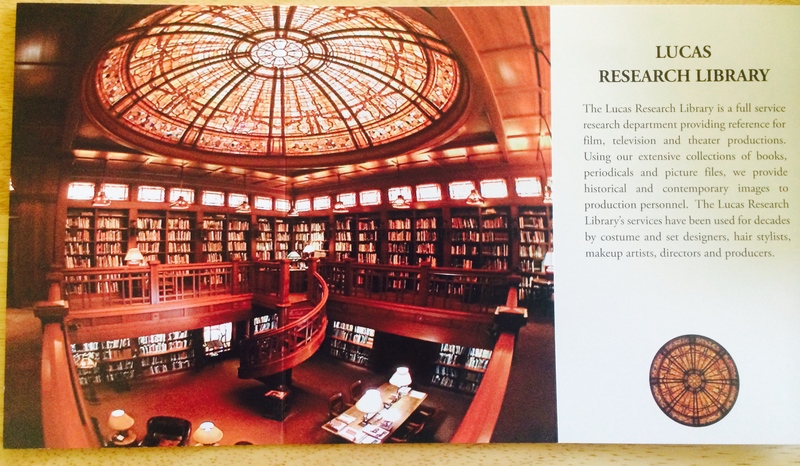 Our tour guide gave us a brochure with a picture of the library on it since we weren’t allowed to take pictures. So even though it doesn’t quite give the full effect of what it really looked like in person, here is a glimpse of what it looks like. In the library, he also had a wooden box with Darth Vader on the front of it. In it he has book of all of the Star Wars movies and each page is a picture of the film frame of each part of the movie. We talked to librarian that was there. What started out as six month job for her turned into a 27 years. George Lucas would honor his employees that have worked for him for 20-30 years. If you had worked there for 20 years you would get an Oscar like statue that was really C3PO. If you had worked there 30 years you would get an R2D2 statute that had glass over it. The employees love it! We toured some more of the grounds and saw where all of the archives used to be held which have now been moved to what they call the archive building. George Lucas plans to have a museum built which will hold all of the Star Wars archives. Talk about Way Awesome! Later, I learned that from the information the tour guide gave us that George Lucas has a guest complex with different rooms. All of the different rooms and suites are named after people that George Lucas admires. Every room is filled with memorabilia, photos, art, books and some are filled with period furniture that is associated with the person the room or suite is named after. One of the people he admires is Frank Lloyd Wright. It’s pretty sweet I must say. Well, it looked as if the tour was coming to an end as we came back to the Tech building. I noticed our tour guide left us for a moment and when he came back he said we had been cleared for him to be able to show us something. We went into what they call the Stag theater. The tour guide allowed us to go to the front of the theater where there were two giant statues. These statues were from Senator Palpatine’s office in the movie The Phantom Menace. They were amazing. The guide then said to have a seat in the theater chairs so that we would have a feel of what it would be like to watch a movie there. So we sat down and he said, it’s too bad that we can’t watch anything. I was like, “yeah.” Then we just all sat there silently, not saying anything at all, in complete, total silence. All of a sudden over the speaker a guy’s voice came saying, Do you want to watch something? The guide totally surprise us and said he had planned for us to watch some things. I must admit at this point I got a little emotional as I was feeling as if I was being spoiled. I was so amazed at the lengths our tour guide was going to, he was truly going out of his way to bless us. He didn’t have to do all of that but he did and I greatly appreciated it! We saw raw footage of Star Wars: A New Hope. It started out with raw footage and then would switch over to what Star Wars really sounds like with the background music, Darth Vader’s real voice, and sound effects. It was amazing! Our tour guide told us that after they filmed the movie the actors and actresses would have to come back in and re-record their lines in the movie. The actors such as Darth Vader’s lines were recorded by someone else. James Earl Jones recorded his voice over the lines of David Prowse who was just the body actor for Darth Vader. In watching the raw footage, it was really strange to hear David Prowse’s voice saying all of Darth Vader’s lines and it sounding so different to James Earl Jones booming voice that had replaced the voice of David Prowse. All that to say I think that George Lucas made a great call on having James Earl Jones voice as Darth Vader. Then we saw part of Indiana Jones and The Raiders Of The Lost Ark. They showed how they layered sounds in order to make it sound so authentic and real when rocks were falling and different things were happening. The last thing we were shown was part of the movie Oblivion. Our guide wanted us to hear how each speaker in the ceiling was used. It was such clear sound and at one point in the movie there is a swooping sound and as the sound moved from speaker to speaker you could feel it under your feet. I had never experienced anything like it. Our tour then came to an end and it was a perfect ending I must say. I was so thankful for our tour guide who was willing to take time out of his day to show us the ranch. I will be forever grateful for this experience and to those who made the day a beautiful one. All in all it was amazing. We saw so much in 3 hours that it would take a lot of time to say everything that happened. But, this was definitely an experience I will never forget. An experience that will remind me that when you ask God for something He just might surprise you! I am not sure as to all of the reasons why God opened the door to go to Skywalker Ranch. Sometimes, I think it was just because I asked Him and He wanted to bless me! Other times I think that He had seen me going through some tough times and just wanted to cheer me up and show me that He loves me and takes notice of even the most minute details in my life. At times I had thought how silly it must be to ask God to be able to see something I would enjoy. But, then He gave me an example of when you want to ask your parents for something and you are pretty sure that they will say no but you ask them anyway because you still have a little bit of hope that they might say yes. You think, well it doesn’t hurt to ask. And so you ask and they surprise you by saying yes. Then, you are glad you said something to them. I guess what I am trying to say is that I believe there are times when God wants us to ask Him! So, I would like to say to you don’t be afraid to ask Him!! No matter how silly you may feel! You may be surprised at the outcome!! Your answer may be yes!! 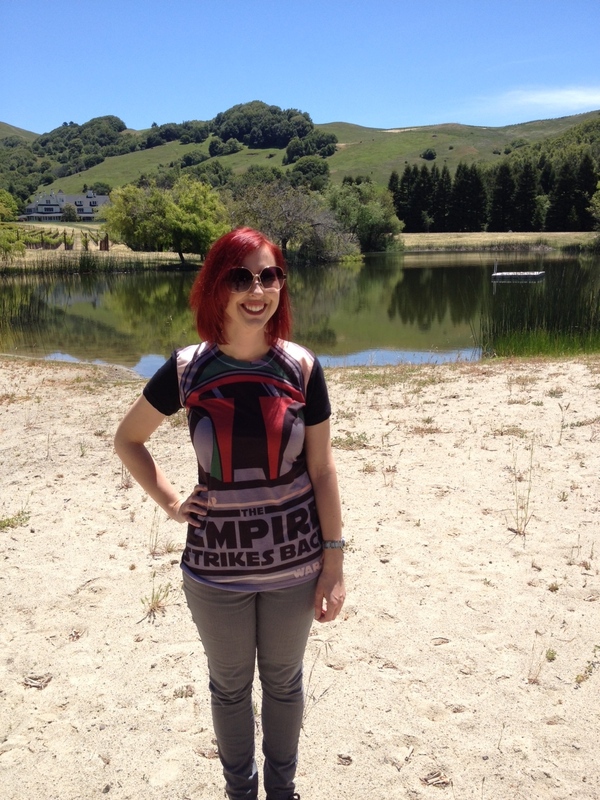 Remember That One Day When I Went To Skywalker Ranch? Yeah…That Was Awesome!!!! Well, today I thought that I would share about something amazing that happened to me. Every time I think about it I wonder if it really happened because it was one of the most surreal experiences I have had in my life! For those who may not know, I am a fan of Star Wars. I grew up watching the movies and they have seemed to have stuck with me ever since. One of my favorite things to do is to look up things about Star Wars. I love finding old behind the scene pictures of the different Star Wars movies with the actors and actresses. I love watching the clips that they have of behind the scenes moments and auditions. I love reading stories about George Lucas and how he thought Star Wars would flop. Obviously, it didn’t. I even have a little Star Wars collection of character figurines, t-shirts and all kinds of stuff. Well, not too long ago I was able to go to Lucas Film Ltd. in San Francisco. It was unexpected thing that happened being as I didn’t even know that it was there let alone, that you could go in and see some of it. It was an amazing experience. I got to get a picture with the Yoda fountain that was in front of the building and then I was able to go inside the lobby and see a lot of the Star Wars exhibits. Then it got me thinking. 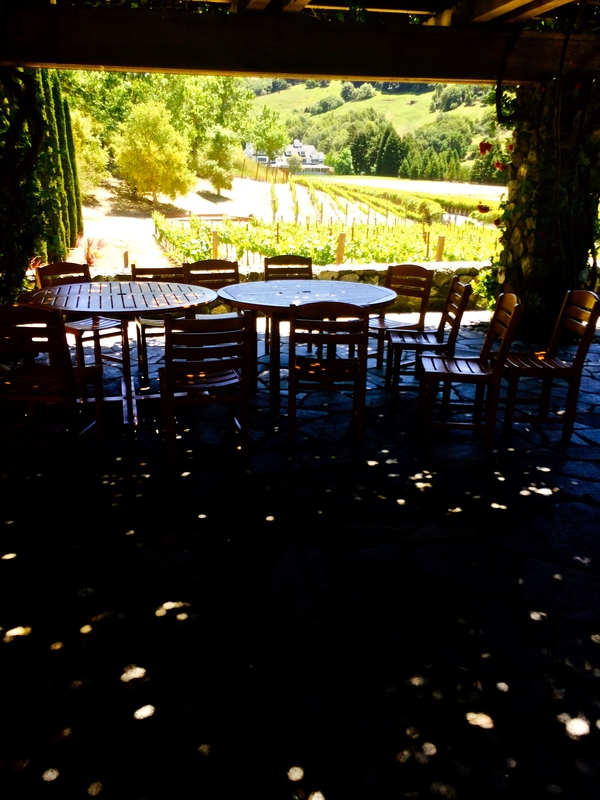 I had heard about Skywalker Ranch which is a movie ranch and the workplace of George Lucas. I thought it would be so cool to get to tour it. So I went on Google to search it out. Well, it turned out that it is very difficult to get a tour at Skywalker Ranch. George Lucas prefers to keep it as a private facility. Even though I thought there was no way that I could go there; I would still look up things about it from time to time. Well, one day I saw an advertisement for a contest. If you entered this contest and won you would win a trip to Skywalker Ranch, have a private tour of the ranch and be able to meet George Lucas and Mark Hamill (Luke Skywalker). At first, I wasn’t sure if it was a scam but, it turned out to be legit. So I entered the contest, eight times actually. Haha! But after I entered the contest I prayed and asked God if I could go. I wasn’t sure that God would work it out but I thought it never hurts to ask. Well, the time came for the announcement of the winner and I didn’t win the contest. I was a little disappointed that I didn’t win but still said to God if there is any way that I can go I would still love to go to Skywalker Ranch. Then, to my complete and utter amazement God provided a way. At that point, I was shocked. What I thought was a closed door wasn’t a closed door. God may have answered no to the contest but it was because he wanted to do it in a more special way. 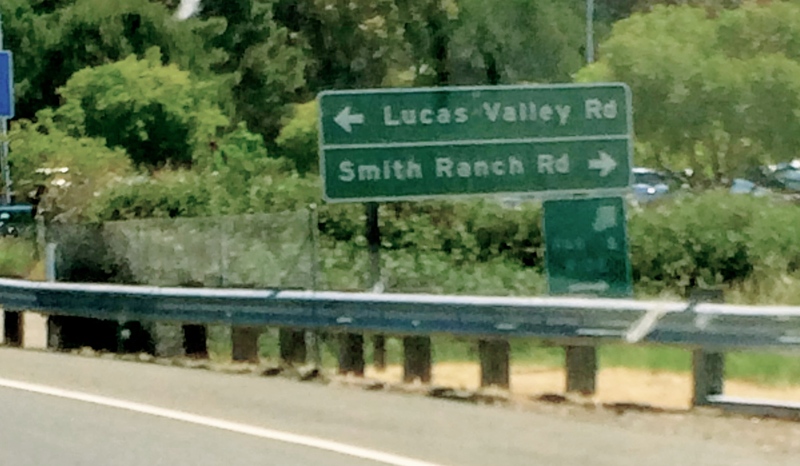 So on May 12th, 2014 I was headed off to Skywalker Ranch. I was pretty much beside myself with extreme excitement. I kept wanting to pinch myself to make sure that I wasn’t dreaming. I believe I had a permanent smile on my face. We started driving down the road and we came up to a security booth. We were questioned by the security guard who then made a phone call to our tour guide. We were given papers that we had to sign in order to go in. The security guard then gave us a map and told us where the tour guide would meet us. We drove down a long winding road and you could see a garden where vegetables were being grown. Just a little side note, George Lucas likes to grow his own vegetables instead of buying them from the store. As we continued along the road, there was a baseball field. Then we came to this huge building that had ivy all over it. We parked our van by the wooden building as this was where we were to meet our tour guide. We met up with our tour guide and he took us inside of the building that is called the tech building. We were not allowed to take any pictures inside of any of the buildings but we were allowed to take photos outside. The inside of the tech building was absolutely stunning. We were first led into a huge room with a polished concrete floor. The room had trees in it, tables everywhere and when I looked up there was a huge skylight that filled the room with light. We then went to our tour guide’s office where he showed us a list of different movies that he had been working on. He is a sound technician for Skywalker Sound. He works on different movies that they do the sound for. He was working on How To Train Your Dragon Part 2, Maleficent and some other movies as well. And yes, he had worked on the Star Wars Movies too. So Cool!! Then he took us to their scoring control room where they work on recording albums and music for movies. He introduced some of the guys there that were working on some things. We were able to hear some of their stories about their experiences with different famous people who had come into record. Our guide then took us inside of their scoring stage where at times they will have an orchestra come in to record. There was a beautiful Grand Piano in the middle of the room. And on the front wall was a gigantic movie screen so the orchestra could play music to the movie that they would be making a sound track for. The walls in the recording studio had the ability to be moved to create the type of sound that they wanted. Even the floor had the ability to change the sound. After that we went outside of the tech building through some different doors, we walked out on to a porch with a beautiful view of the ranch. We then walked down a pathway of stairs and when you looked left or right there were rows of beautiful roses. The guide pointed out a rock that was there and told us that there was a video camera in it. Apparently, they have them everywhere. The pathway led to a gate and as we went through it there was a lake in front of us. This was no ordinary lake. It was a manmade lake that George Lucas wanted there. He calls it Ewok Lake. This was my absolute favorite as I love the Ewoks. So, when our tour guide said that we could get our picture taken there if we wanted to I was like YES!!! So I did!! Our tour guide then told us it was time for lunch which I was quite surprised at as I didn’t know that we would be eating there. He took us to a building where the employees eat. I kept thinking I am having lunch by Ewok Lake this is so cool! I couldn’t stop smiling and had earned the nickname “smiley” while I was there. Even though, I am one who smiles a lot anyway it was obvious that I was on cloud nine. I am sure my smile was bigger than usual! When we went to order our food, I realized that our tour guide was going to pay for all our lunches. So, I started concocting a plan of how I could pay for it. When he started to give his credit card to the cashier, my dad beat him to it and said he would pay for it. The guy said what do you want to arm wrestle for it? Everyone laughed. Then he let my dad pay for it. As we were waiting for the food, we were told that George Lucas loves art and one of his favorite things is stain glass. So our tour guide told us a story about one of the stain glass windows that was in this building. They had been renovating the building and there was a particular stain glass window that had been there since the beginning. George Lucas was going to come in and look at the stain glass window to see if he wanted to still have it in the building. Well, the lady who had made the stain glass window had it wrapped up in this cloth and moved it into the barn that was on the ranch. There was a guy who had just started a job there and he was in the barn and was moving stuff around. He saw some cloths and didn’t think that there was anything underneath it and put his knee on the cloth and then realized the stain glass was in it. Unfortunately, it cracked but the good news was they were able to fix it and George Lucas chose to have it inside of the building. It has become one of the favorites. During lunch, we heard some little tid bits about the upcoming Star Wars movie. It shall be interesting. Yes, it shall. After lunch the tour guide took us to the General Store there and we were able to buy some things in the store. So, I did not hold back and bought a few things. I thought, “I may never come back here so I am going to leave with some souvenirs.” So I have some little mementos from the ranch only to remind myself that I was there. Plus, the mementos are pretty cool. One of the things I bought was a maroon hoodie. Our tour guide told us that George Lucas loves that color so all of the firetrucks and vehicles on the ranch are in that color. We saw vehicles in that color driving around the ranch. I thought it made the hoodie even more special because of the meaning behind it. Well, you may be wondering what happened next. But, I will have to save the rest of the story in a to be continued blog entry for next week. Only because there is a lot more to say. I hope you are enjoying what you’ve read so far. Stay Tuned!! Until next week!! Don’t you just love it when someone keeps their promise? Especially when it has to do with something that you would really enjoy. Each time you think about it, you smile to yourself and you may even feel like you’re on cloud nine. What an exhilarating feeling!! But what about the times when a promise is broken due to circumstances not working out? Or it was due to just plain negligence and distraction from the person who gave it. It is so easy to feel discouraged, upset and even devastated. Depending on the situation, distrust in that person’s ability to follow through can start to set in. What about this? Have you ever received a promise from God? You feel excited about the future and all that will take place. But then a series of bad things happen in your life all at one time and you find yourself starting to lose hope. Or how about when you have been praying for years to see the promise come to pass and it hasn’t. That’s when discouragement and faint heartedness can set in. You can begin to feel like God has forgotten about you or that He doesn’t care. Well, I would like to share with you a story about someone who had a promise from God and it looked as if that promise would not be fulfilled. I would like to tell you a story about a man named Abraham. You can find his life story in the book of Genesis in the Bible. Abraham and his wife Sarah longed to have children. God gave Abraham a promise that one day he would have a son. God also gave Abraham a promise that He would become the father of many nations. However, many years passed and he still had not received the fulfillment of God’s promises. 25 years had gone by since God gave Abraham and his wife the promise of a son. At this time, both Abraham and his wife were past the age of being able to have children. Did Abraham complain, give up and walk out on God? Did he get bitter and think that God was one who doesn’t keep His word? Did he think that God had forgotten and abandoned him? Well let’s find out. Romans 4 in the Message says, Isn’t that what we’ve always read in Scripture, God saying to Abraham, “I set you up as father of many peoples”? Abraham was first named “father” and then became a father because he dared to trust God to do what only God could do: raise the dead to life, with a word make something out of nothing. When everything was hopeless, Abraham believed anyway, deciding to live not on the basis of what he saw he couldn’t do but on what God said he would do. And so he was made father of a multitude of peoples. God himself said to him, “You’re going to have a big family, Abraham!” Abraham didn’t focus on his own impotence and say, “It’s hopeless. This hundred-year-old body could never father a child.” Nor did he survey Sarah’s decades of infertility and give up. He didn’t tiptoe around God’s promise asking cautiously skeptical questions. He plunged into the promise and came up strong, ready for God, sure that God would make good on what he had said. That’s why it is said, “Abraham was declared fit before God by trusting God to set him right.” But it’s not just Abraham; it’s also us! The same thing gets said about us when we embrace and believe the One who brought Jesus to life when the conditions were equally hopeless. The sacrificed Jesus made us fit for God, set us right with God. Abraham’s response to God concerning God’s promise was that He trusted God anyway. Why? Because, He knew the faithfulness of God. It didn’t matter to him that it looked like all of the odds were against him. It didn’t matter that there was every reason in the natural that what God had promised wouldn’t come to pass. He believed that God would do what He said that He would do. And then you see God’s response to Abraham. “Abraham was declared fit before God by trusting God to set him right.” Another version of that verse says, God saw his faith and counted him as righteous; this is how he became right with God. You know you might be going through a rough season right now. If so you are not alone. I get it. I am still waiting for the fulfillment of a promise that God has given me. It can be tough when all the circumstances seem to be pointing to the fact that it would never happen. Yes, it looks like the odds are against me. I have even had my moments of discouragement. But, what I have been learning is this, if you look at the end of Romans chapter 4 you will notice that is says, But it’s not just Abraham; it’s also us! The same thing gets said about us when we embrace and believe the One who brought Jesus to life when the conditions were equally hopeless. The sacrificed Jesus made us fit for God, set us right with God. We too can have the same result as Abraham did when he believed God when it all seemed hopeless. I am learning that as I believe that God will do what He says He will do, it will be accounted to me as righteousness. This gives God the ability to work on my behalf as I wait on Him and trust Him. I know that when the promise is fulfilled that it will bring glory to His Name because it wasn’t anything that I made happen on my own. I just believed in Him and He brought it to pass. I want to encourage you today to keep your hope in God. He will not let you down and He will not go back on His promise. My prayer for you today is that if you are in a place where it looks like all of the odds are against you, that God will give you the strength to trust Him. I also pray that you will not give up hope and that you will rest in the fact that He loves you and is working behind the scenes. What you are going through right now will pass!! As it has been said and is so true, “storms don’t last forever.” Dawn will always come after the long night. He is faithful to His Word and He will be faithful to you. Look to Him!! Believe in Him!! Trust Him to fulfill His every promise!! 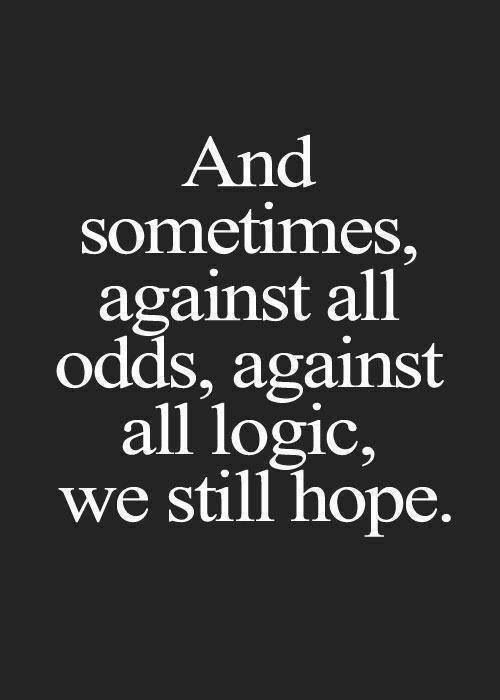 Know that because you believe in Him the odds will be in your favor!! Know that He is working behind the scenes even now!! It will just be a matter of time before you see it!! Believe in Him!! In a blog entry I published a couple of weeks ago, I established that we are God’s treasure. (If you haven’t read it yet I would like to encourage you to check it out.) But, in this blog entry I would like to talk about a different aspect of the word treasure. So, I would like to share with you a couple of stories from my own life. I was at a prayer meeting at our church and my dad who is a pastor had just purchased these bracelets for people to be able to wear. On the bracelet there are two words “God’s Treasure.” My dad wanted people to be reminded that they are God’s Treasure and what a great reminder to have right there on your arm, a bracelet saying God’s Treasure. Well, during the meeting my dad said, I would like to get more of these bracelets so that we can pass them out to people in our community. Then they can know that they are God’s Treasure. The people from our church would pray and ask God who they should give the bracelet to and then give it to them. Well, the next day I went to one of our local stores as I had to buy some things. I grabbed what I needed and got in line. There was a long line and only one cashier at the register. I looked over and there was another lady that worked there that came up behind the counter. She said to me I can help you over here. As I started walking toward her, my eyes glanced at my wrist. I was wearing the bracelet that said God’s treasure on it. I hadn’t been thinking anything about it and there it was before me. I went up to the cash register and thus a thought war began in my head. I thought, oh am I supposed to give this bracelet to this lady? Then I thought no, this is my bracelet I should keep it because I need to be reminded that I am God’s Treasure. Then the lady said to me, would you like to buy a bag to carry your stuff in? I said yes. As I was thinking yeah because I am going to give her this bracelet. Yes a lot was going through my mind in that moment. Do I give her the bracelet or not? That was the question. I noticed there was someone standing behind me and was going to leave when I thought what if this is God prompting me to give her this bracelet. Then, I just couldn’t leave, I needed to obey Him. The next thing that I knew was I was taking the bracelet off of my wrist and I started to hand it to the lady. I said I feel like I am supposed to give this to you so that every time you wear this bracelet and you look at it you will know that you are God’s treasure. The lady smiled at me and immediately put it on her wrist. I told her to have a good day and left the store. It was such a glorious feeling to know that I had just shared God’s love with someone. The next story that I would like to share with you is when I received a message on Facebook from a friend asking if I would do a favor for them. The favor was to write a letter of encouragement to a young lady who was going into rehab for 30 days to get free from an alcohol addiction. This was the second time that this young lady would be going into rehab. The first time she was there, her aunt would send her a card of encouragement for every day that she was in rehab. This helped her get through the time that she was in there. Since then, her aunt had passed away so she was sad that she would not be receiving any cards of encouragement for the 30 days that she would be in there. So my friend asked me if I would send the young lady a letter of encouragement. At first I admit that I was a bit reluctant as I had never met the young lady. But, I felt a tugging on my heart and I agreed to do it. As I was thinking about what I should write to the young lady, I suddenly felt God’s tremendous love for her. I felt that He wanted me to tell her how much He truly loved her. He gave me some scriptures to share with her. I started crying because I could feel God’s heart for her and how valuable she was to Him. I then remembered that I had another bracelet that said God’s Treasure on it. I put it in the envelope and sent her the card. I am sure you may be wondering why I am sharing this with you today. Well I will tell you. God not only wants us to know that we are His treasure but He wants others to know as well. 1 John 4:7 says, My loved ones, let us devote ourselves to loving one another. Love comes straight from God, and everyone who loves is born of God and truly knows God. When we share the love of God with others, we are showing them who He is. You never know what someone may be going through. They could be going through a really rough time or may be they have never experienced what real love is. As you allow God to love them through you, they will begin to see a glimpse of who He is, how much He loves them and how valuable they are to Him. I would like to challenge you to ask God this week who He wants you to reach out to and show His love to. It will not only change that person’s life but it will also change yours! !